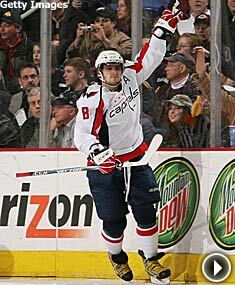 The Washington Capitals' Alex Ovechkin captured both the Art Ross Trophy and the Maurice Richard Trophy this season. NEW YORK -- Washington Capitals left wing Alex Ovechkin has joined an elite group of players who, in the same season, have won the Art Ross Trophy for the National Hockey League scoring championship as well as the Maurice Richard Trophy for being the League’s top goal scorer, while Detroit Red Wings goaltenders Dominik Hasek and Chris Osgood have captured the 2007-08 William Jennings Trophy as the goaltenders for the club finishing the season having surrendered the fewest goals. The awards will be presented at a media event to be conducted during the Stanley Cup Final. Ovechkin won the Art Ross Trophy by finishing the season with 112 points (65 goals, 47 assists), six more than Evgeni Malkin of the Pittsburgh Penguins (47-59--106) and 14 more than Calgary Flames right wing Jarome Iginla (50-48--98). Ovechkin’s League-leading goal total, an NHL record for left wings and the highest in the NHL since Mario Lemieux had 69 in 1995-96, made Ovechkin the first Russian-born player to win both trophies in the same season. Atlanta’s Ilya Kovalchuk finished second to Ovechkin with 52 goals, with Iginla third. Ovechkin becomes only the sixth player in the past 37 years to lead the League in goals and points in the same season, joining a group that includes Phil Esposito (1970-71 through 1973-74), Guy Lafleur (1977-78), Wayne Gretzky (1981-82 through 1984-85, plus 1986-87), Mario Lemieux (1987-88, 1988-89) and Iginla (2001-02). Osgood appeared in 43 games and Hasek in 41, with each surrendering 84 goals as the Red Wings finished with the most points in the League (115) and the fewest goals against (184).